You don’t get any more dramatic than a Super Moon lunar eclipse in Leo, frankly! Not only will this Full Moon be very large and prominent in the sky, making it a lot easier to see it take on the blood red colour of the earth’s shadow, but it will also be a Blue Moon. In essence, Blue Moons are the second of two full moons to take place within the same month. You could say that it is the universe’s way of underlining the need to release/celebrate whatever issue or situation the sign of Leo has come to represent for you since the Leo solar eclipse of August 2017. Ideally, the best way to do this is to consult an astrologer, who can tell you where the Sun and Moon will be located in your chart at the time of the eclipse. You can also get a rough idea by ordering a natal report, which will show you exactly how the zodiac is divided up by your 12 houses. However, in the absence of that option, you can read my forecast – although more general in scope and interpretation, it will give you some indication of the themes and symbolism at work around this time. All lunar eclipses occurs at Full Moon, which always signifies a time of FINISHING OFF/CELEBRATION/CULMINATION. This energy is given a further boost by being both a Super Moon and a Blue Moon. Consider this eclipse, then, to be a cosmic full stop or exclamation mark – a rather loud and possibly dramatic reminder of what you need to let go of or leave behind. In many ways, it seems designed to emphasise the fact that we have now entered a new year and it is time to draw a line under certain emotional, health or domestic priorities which may have dominated your innermost thoughts and taken up a great deal of your emotional energy during the last half of 2017. Remember that at Full Moon, the Sun and Moon are in opposite parts of the sky, which points to the need to rebalance conflicting needs or polarised states such as heart vs head, masculine vs feminine and inner vs outer. This has both a social dimension to it (a party) and a rather decadent feel about it – people dressing up, looking to see and be seen; eating and drinking, and partying/enjoying themselves – all of which is very much in keeping with the sign of Leo. The suggestion of this degree then, is that there may well be a social aspect to events that occur between now and the solar eclipse on 15 February 2018. Perhaps you will spend it with friends, celebrating some sort of personal milestone/success? Given that this eclipse is also very much about endings, it could even take the form of a divorce party or retirement/leaving do – a positive and fun way to commemorate the end of an era or chapter in your life. Leo is generally a pretty upbeat sign, but one that loves applause and recognition, so the idea seems to be stop and take a round of applause; rest and let your hair down after a period of hard work, or perhaps draw a line under a goal or project you have been working towards achieving over the last six months or so in a constructive way. At the time of this eclipse, the Moon will be travelling close to the North Node, suggesting that whatever you choose to work on or let go of now will be for your highest good and so even if not easy or straightforward, should be attempted with sincerity and determination. The Sun, currently travelling through Aquarius, where it is not terribly happy (traditionally it is said to be in detriment) will conjunct Venus in Aquarius. This means that Venus will be getting it from both sides in terms of an onslught by the luminaries. On the one hand, she will be under the rays of the Sun, which could be interpreted as a female/feminine qualities which are being upstaged/outshone/overshadowed by a prominent or domineering male figure. On top of this, she and the Moon – usually her planetary ally in cosmic terms – will be opposition – and so essentially at loggerheads. Two females fighting over one male? Or simply one rather glamorous but standoffish female versus one who is emotionally demanding and requires a lot of attention. Mercury, symbol of thoughts, words, commerce and travel, will also ingress into Aquarius on the same day as this eclipse, giving this particular day a liminal feel to it. It is also possible that this emphasis on Aquarius will mean that although some of us may feel a strong desire to draw attention to ourselves and focus on our own emotional needs, that we will not be allowed to forget our responsibilities to others, and to society now. In other words, it’s not all about me, me, me now! Venus will be orbiting close to the Sun in Aquarius at the time of this eclipse. Venus will be close to the fixed star, Sualochin, which forms part of the part of the constellation of Delphinus, giving us a wonderful image of a dolphin swimming amongst the waves of the waters of Aquarius. Sualochin is the star which forms the curved back of the dolphin, which Bernadette Brady sees as being ‘Tantalising but naive,’ which fits well with the childlike but charismatic qualities of Leo, the sign of this particular eclipse. 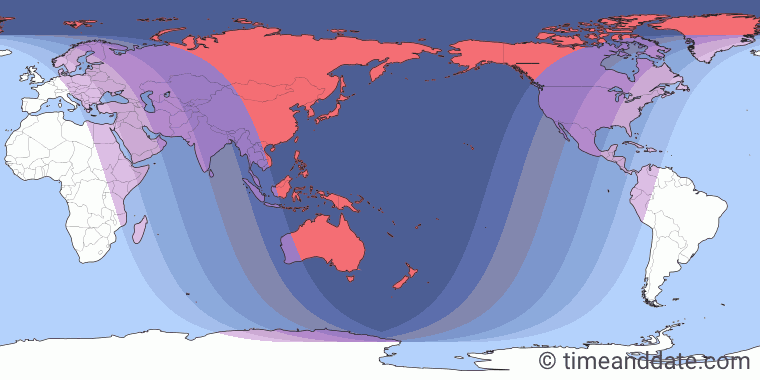 The eclipse will begin at around 31 Jan, 10:51:13 and last until around 16:08:29 UTC. For more information, and a diagram of its visibility, visit the NASA website. This group of lunar eclipses (Van den Berg Saros no. 124) previously occurred in 1909, 1927, 1945, 1963, 1982, 2000 and will not take place again until 2036.